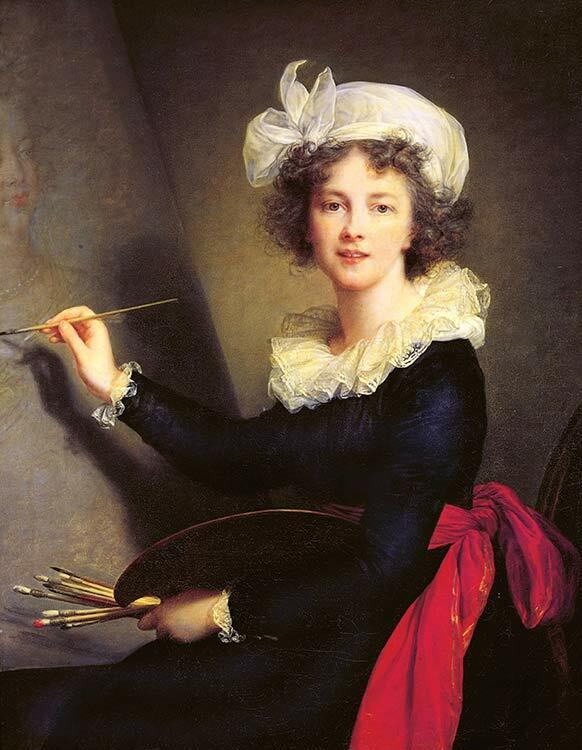 The life of the beautiful, clever, and prodigiously gifted Elisabeth Louise Vigée Le Brun (1755-1842) is one of those rags-to-riches sagas irresistible to storytellers of any era. She was born in Paris to a minor portraitist and a hairdresser, but sent to live with relatives in the French countryside at the age of six and educated at a convent. Largely self-taught as an artist, she was already working as a professional portraitist while still in her teens, supporting her family after her father’s death.At 19, she was exhibiting publicly at the painter’s academy of Saint-Luc. Two years later her marriage to her mother’s landlord, Jean Baptiste Pierre Le Brun, the premier art dealer in Paris, propelled her into society, and their fashionable townhouse gave her a showcase for both her paintings and her considerable charm. 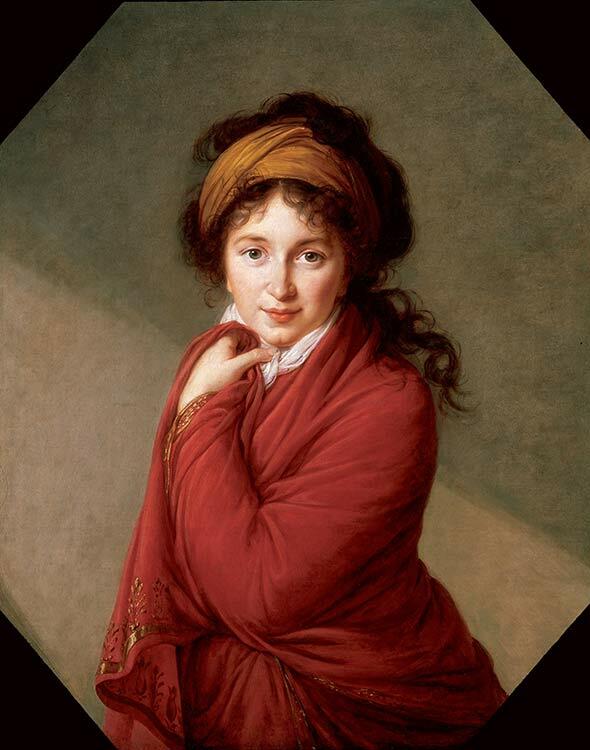 She “succeeded in differentiating herself from the mass of dull academicians or pseudo-Bouchers by promoting, in her social life as well as her art, the cult of the unaffected,” writes Simon Schama in Citizens, his history of the French Revolution. Self-Portrait (1790), oil on canvas, 39-3/8 by 31-7/8 inches. 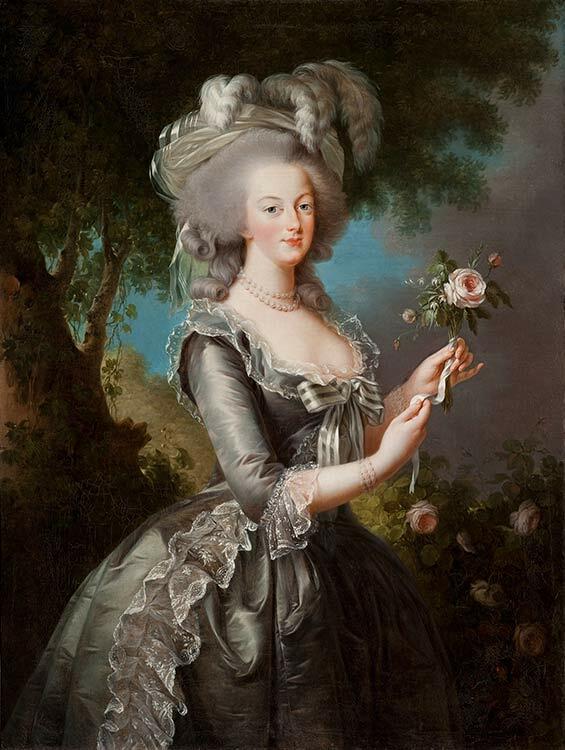 Marie Antoinette with a Rose (1783), oil on canvas, 39-3/8 by 31-7/8 inches. The Duchesse de Polignac in a Straw Hat (1782), oil on canvas, 36-3/8 by 2-7/8 inches. Madame Grand (1783), oil on canvas, oval, 36-1/4 by 28-1/2 inches. 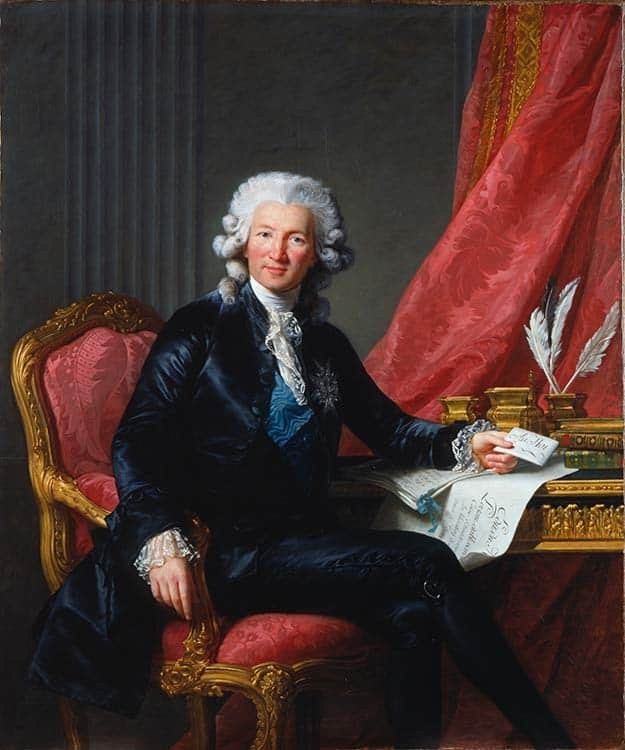 ​Comte Charles Alexandre de Calonne (1784), oil on canvas, 61-1/4 by 51-1/4 inches. Countess Varvara Nikolayevna Golovina (1797-1800), 32-7/8 by 26-1/4 inches. 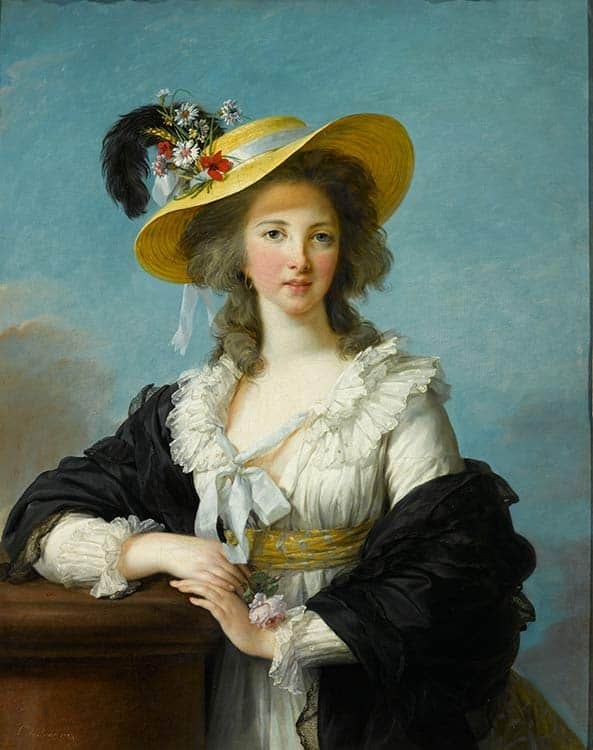 It wasn’t long before Marie Antoinette, who was only a few months younger than the artist, summoned Vigée Le Brun to court. She would eventually paint more than 30 portraits of the queen and her family. Her first official likeness was a traditional image of Marie Antoinette in court dress, in three-quarters profile, costumed in one of the stiff dresses with side hoops (called panniers) popular in the day. But styles were changing, in part in an effort to soften the royal image. “Hair powder, elaborately structured coiffures, stays and hoop petticoats were all banished except for formal ceremonies,” Schama writes. “Instead hair was encouraged to fall in natural curls over the shoulders; flowers and grasses were used for ornament on straw bonnets and wide-brimmed rustic hats.” In her portraits and self-portraits, Vigée Le Brun captured this fetching but carefully calculated nonchalance. 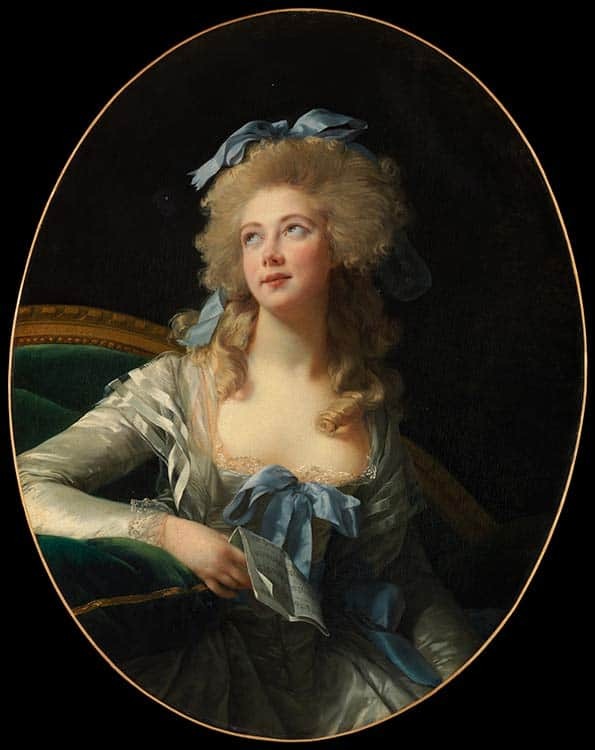 One can only guess at what sort of bond existed between the queen—who was increasingly vilified in the press—and the vivacious artist, but in one official commission, a propaganda piece shown at the salon of 1787, Marie Anoinette and Her Children, Vigée Le Brun hoped to exploit sympathies for the queen’s loss of a baby by seating her and her remaining children in front of a significantly empty crib. It was all for naught, of course. The queen lost her head and Vigée Le Brun fled France with her young daughter, Julie. For decades she lived and worked in Italy, Austria, and Russia, where she painted Catherine the Great and was made a member of the Academy of Fine Arts of Saint Petersburg. Eventually, after her name was removed from the list of counter-revolutionary émigrés, the artist was able to return to France during the reign of Napoleon I. She lived in comfortable style, writing her memoirs and painting, until the ripe old age of 87. Through May 15, 2016, the Metropolitan Museum of Art will be celebrating this remarkable artist in the exhibition “Vigée Le Brun: Woman Artist in Revolutionary France,” the first retrospective and only the second exhibition devoted to the artist in modern times. The 80 works on view at the museum comprise paintings and a few pastels from European and American public and private collections. Wonderful story. Great to read of and about this remarkable artist. PS needless to say, I enjoy reading all the little details in her complex life. Stay tuned for a podcast with the curator, sometime in March. I will keep everyone posted. That is so impressive , all those exquisite portraits ! She certainly deserves this attention, at long last ! She clearly was very capable, gifted fortunate, after some early bumps; to survive to age 97 and include her memoirs! Very glad to have “discovered” her, Thanks Ann. I was mistaken about her age. She lived to the be 87. But that’s pretty darn impressive. Maybe the message to all of us creatives is to keep going forward, no matter what. I will not drown today in the nation’s woes, but be strong in my artistic pursuits.